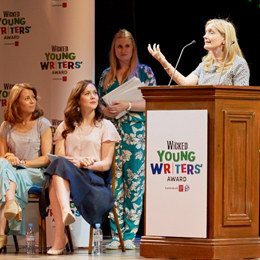 Entries for the 2019 Wicked Young Writer Awards are now closed and we’ll be announcing the shortlist of finalists by mid-May. Keep your eyes peeled on the website and if you are one of our 120 finalists you will be contacted through the email address you provided on your submission form. Judges criteria: originality, narrative, descriptive language, characterisation. Win four tickets to see the London production of WICKED at the Apollo Victoria Theatre. Meet cast members after the show along with an exclusive backstage tour. £50 worth of books/eBooks tokens to spend. £100 worth of books for the winners' school library donated by Hachette Children’s Group. An annual subscription to First News. A self-publishing package from Spiderwize, to publish your very own work. Work experience at First News newspaper, shadowing the editor Nicky Cox, MBE. All finalists’ entries get printed in the Wicked Young Writer Awards anthology. The "prestigious Wicked Young Writer Awards" (The Times) was established by the long-running musical WICKED to link the important messages of the production with a competition that would inspire young people to use creative writing to look at life a little differently. Since its launch in 2010, we have received over 20,000 entries to the award. The Award recognises excellence in writing, encourages creativity, and helps develop writing talent in young people between 5-25 years old from all backgrounds and areas of the UK. In 2016, a sixth category, the FOR GOOD: Award for Non-Fiction was introduced to encourage 15-25 year olds to write essays or articles that celebrate the positive impact that people can have on each other, their community and the world we live in. The category celebrates the WICKED: FOR GOOD programme, which supports charitable causes at the heart of the stage musical. 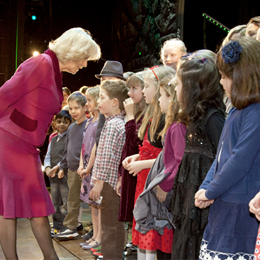 Each year, we hold a very special prize giving event at the Apollo Victoria Theatre for all 120 of our finalists. The event is attended by our judges, including head judge Cressida Cowell, the WICKED cast and a range of special guests and includes special performances, Q&As and rehearsed readings of the winning entries, performed by WICKED's principals. All finalists also receive a printed copy of their entry as part of the annual Wicked Young Writer Awards Anthology. The Award is proud to partner with National Literacy Trust.